Great photo! My dog obsessed preschooler wants me to print it out for him! 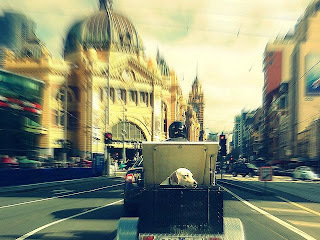 Great photo- so very Melbourne. Phew! I thought you were going to say you'd bought a puppy!?! Super cool pic! How awesome is that! It's captured so brilliantly! That is one of the best photographs I have seen for ages - gorgeous! What a darling. Well spotted. I was considering cutting my hair the other day too!